On April 21-22, Shakespeare OC will join the Orange County Community Foundation and more than 340 other non-profit organizations in the very first countywide Giving Day. For 30 hours starting at 6:00am April 21, you can visit www.iheartoc.org and donate to SOC and your other favorite local non-profits. Your generosity on Giving Day will also enable SOC to win additional funding awards and prizes from the Foundation Bonus Pool, all of which will help them bring the Arts to an underserved, but culturally rich part of Orange County. 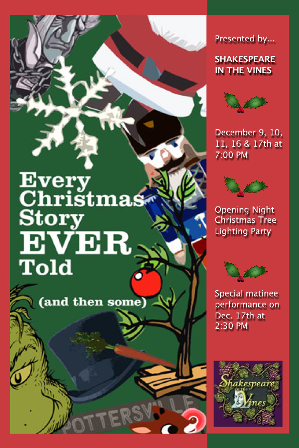 Get ready for a healthy dose of holiday cheer from your favorite Los Angeles Shakespeare companies! Here are a few of the ways you can celebrate with your favorites this Christmas season. 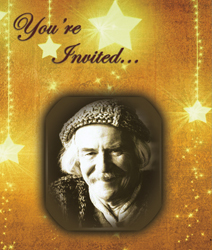 Will Geer’s Theatricum Botanicum’s will hold an Olde Fashioned Yuletide Celebration on Saturday, Dec. 13 at 6:00 pm. Festivities include carol singing, sweet and savory goodies, silent auction, holiday libations, an artisan gift shop, a visit from Father Christmas, the story of “St George and the Dragon,” and a reading of Leo Tolstoy’s holiday story “What We Live By” by special guest Amy Madigan. All proceeds benefit educational programming at Will Geer’s Theatricum Botanicum. The event will take place at Topanga Mountain Mermaid (Parking at Theatricum Botanicum, 1419 N. Topanga Canyon Blvd. with shuttle service to the venue). Tickets are $200 and all proceeds benefit Will Geer’s Theatricum Botanicum. A portion of the ticket is tax-deductible. Call (310) 455-3723 for tickets or visit www.theatricum.com. 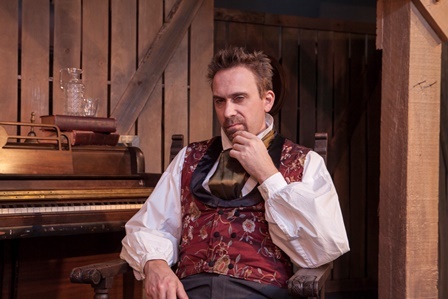 Over in Atwater Village in the ISC Studio, Independent Shakespeare Co. recreates (with a little artistic license) the experience of a public reading of A Christmas Carol With Charles Dickens given by Dickens himself. Based on the novelist’s own adaptation, it is performed by ISC co-founder David Melville as Charles Dickens, playing nearly every character in the story with musical accompaniment and dramatic interjections by a young American actress, Miss Aks. Expect a performance full of the acting pyrotechnics Dickens was famous for, holiday music, wry humor, and redemption.Performances are Dec. 6, 13 & 20. Tickets: www.iscla.org. 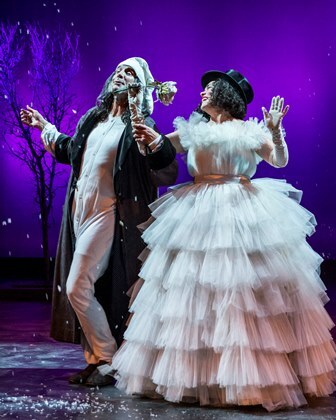 There will also be one performance of A Christmas Carol With Charles Dickens across town at the Geffen Playhouse on Monday, Dec. 1 at 7:00 pm. Click Here for tickets. A Noise Within continues their family holiday tradition with Charles Dickens’ A Christmas Carol. Dec. 5 – 23. Directed by Geoff Elliott (who adapted the play from the novella) and Julia Rodriguez-Elliott, the production also features evocative original music by Ego Plum. 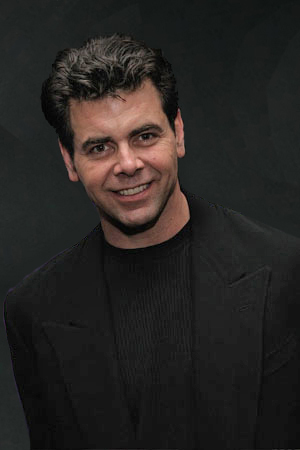 The cast includes Geoff Elliott as Scrooge, with Freddy Douglas, Stephen Rockwell, Rafael Goldstein, Jill Hill, Mitchell Edmonds, Deborah Strang, Alan Blumenfeld, Alison Elliott, Georgia Miller, Jack Elliott, Marie Sullivan, Ikenna Ogbogu, Chiza Ogbogo, and Seven Pierce-English. Tickets: (626) 356-3100 or www.anoisewithin.org. There will also be a Pay What You Will performance on Wednesday, Dec. 17. 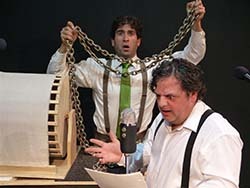 Long Beach Shakespeare Company will present Orson Welles’ radio adaptation of A Christmas Carol on Dec 19, 20 & 21. Mike Austin returns as Scrooge in LBSC’s annual presentation of the 1939 radio adaptation of Charles Dickens’ A Christmas Carol. 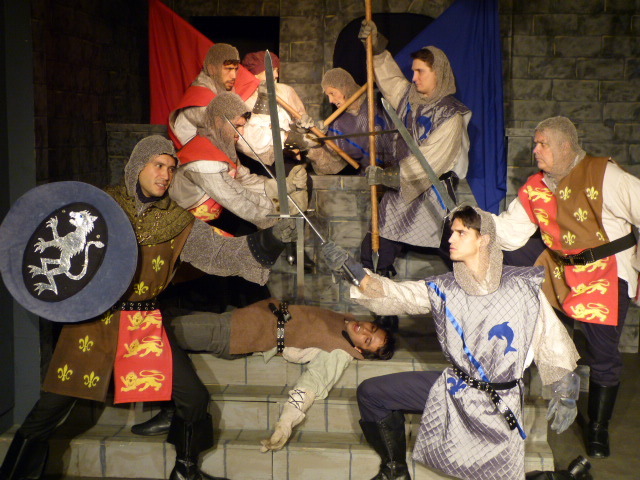 The live web-cast features sound effects and music performed by the actors. Also for the holidays the company will offer The Plot to Overthrow Christmas, a fully-costumed, staged version of the original 1938 radio play by Norman Corwin. Featuring colorful characters such as Mephistopheles (the Devil), Lucrezia Borgia, Caligula, Ivan the Terrible, Simon Legree and Nero, and other fiends in Hades, it concerns a plot to murder Santa Claus and destroy Christmas forever. Nov. 28 – Dec. 14. For tickets and more information visit www.lbshakespeare.org. 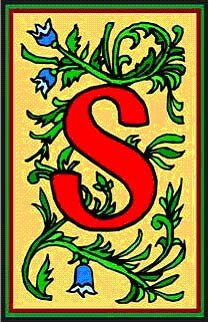 Shakespeare in the Vines will present Every Christmas Story Ever Told (And Then Some) by Michael Carleton, John K. Alvarez, and Jim FitzGerald, Dec. 4 – 13 performed inside Carol’s Restaurant at Baily Vineyard and Winery in Temecula. Three actors decide that instead of doing Charles Dickens’ A Christmas Carol again, they’ll perform every Christmas story ever told. They take holiday cheer to the extreme with a fast and furious look at the holiday classics and traditions we all know and love. No holiday icon is spared in this tour de farce of hilarious holiday merriment, from Tiny Tim, Frosty, and Rudolph to the Grinch and It’s a Wonderful Life. 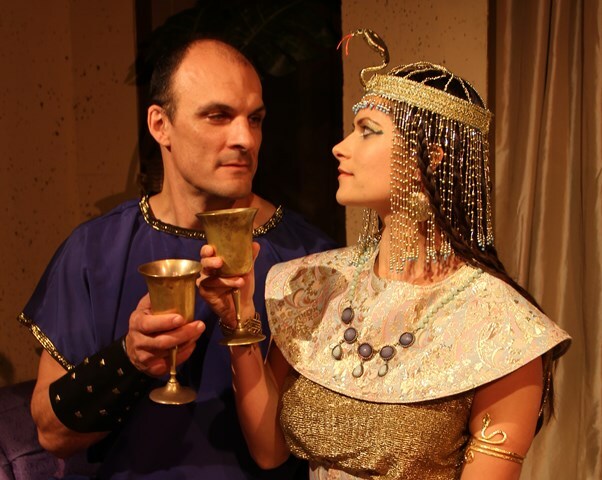 Seating begins at 5:30 pm for dinner (Friday and Saturday night performances only); 6:00 pm for show only. Dining reservations must be made through Carol’s Restaurant by calling (951) 676-9243. On the menu: Winter Salad of baby mixed greens, sliced pears, candied walnuts, blue cheese and citrus vinaigrette, slow roasted boneless short rib, horseradish mashed potatoes, winter vegetable medley, pumpkin cake with Riesling caramel sauce and whipped cream, and your choice of a 2012 Montage or 2010 Sangiovese wine. And at The Old Globe, everyone’s favorite green meanie will return for his 17th consecutive year in Dr. Seuss’ How the Grinch Stole Christmas!, the heartwarming musical based on the classic book and animated film. James Vásquez returns to direct this beloved San Diego holiday tradition which will run Nov. 15 – Dec. 27. Burke Moses makes his Old Globe debut as The Grinch with Taylor Coleman and Gabriella Dimmick alternating in the role of Cindy-Lou and Steve Gunderson returning as Old Max. Tickets: (619) 23-GLOBE or www.TheOldGlobe.org. If you love the Adventures of Robin Hood, then you’ll love Shakespeare’s As You Like It. The magical Forest of Arden hides a banished group of heroes, damsels in distress and in disguise, and rollicking romance and comedy. You’ll hear some of Shakespeare’s most often quoted lines and meet some of his best-loved characters in this fast-paced, light-hearted tale that promises fun for the whole family. 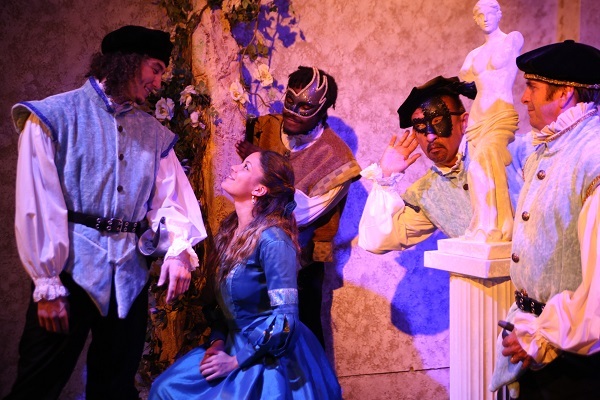 Presented now through June 29 (Fridays & Saturdays at 8:00 pm, Sundays at 2:00 pm) by the Long Beach Shakespeare Company in the Richard Goad Theatre, 4250 Atlantic Avenue, Long Beach, CA 90807 in Bixby Knolls. General Admission tickets are $20, Students $10. 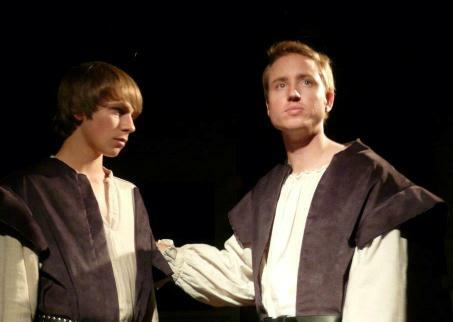 For more information and to purchase tickets visit http://lbshakespeare.org/.